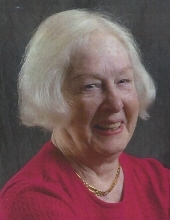 Martha Wellborn age 84 of Decatur passed away on April 11, 2019. She was a daughter of the late Mr. and Mrs. Herman and Era Wellborn. She was a loving sister and aunt who will be greatly missed. She was a resident of Benton House of Decatur Senior Living. Martha was a native of Atlanta and was a graduate of Roosevelt High School. She attended Rehoboth Baptist Church. She is survived by her sisters and brothers in law, Rheba and Bobby Fronebarger and Angie and Johnny Bailey; niece, Ginger Fronebarger Couch and her husband, Lee; nephews Ted Bailey and Michael Bailey and his wife, Nancy. A graveside Service will be held Monday, April 15, 2019 at 1:00 PM at Westview Cemetery with Pastor Dave Riley of Sacred Journey Hospice officiating. The family will receive friends 30 minutes prior to the service at the cemetery. A.S. Turner and Sons Funeral Home and Crematory. To send flowers or a remembrance gift to the family of Martha Wellborn, please visit our Tribute Store. "Email Address" would like to share the life celebration of Martha Wellborn. Click on the "link" to go to share a favorite memory or leave a condolence message for the family.